As Anita once said, “Come in! We won’t bite you until we know you better”, Mother Nature looks to be heading down the same road. 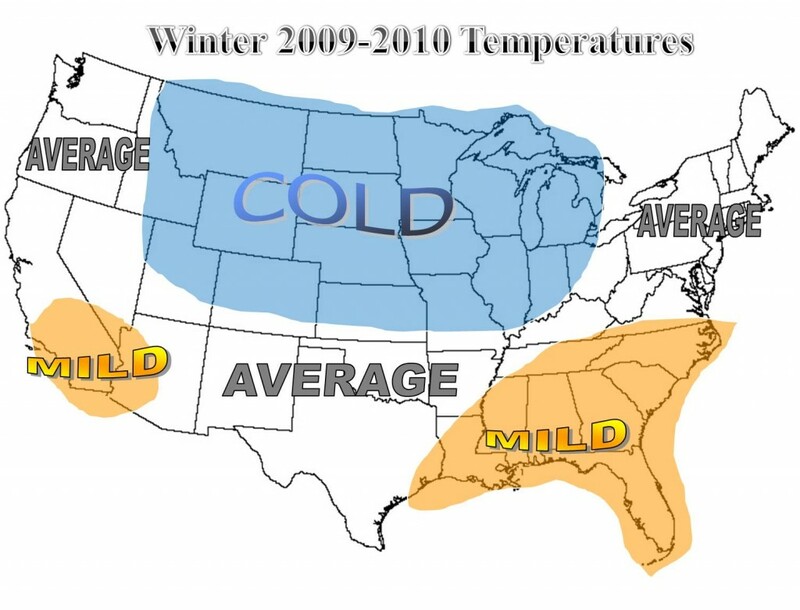 November 2006 featured an impressive outbreak of cold, and later snow. January 2007 featured another helping of the goods. December 2008 spilled the coldest air in 20 years over the Northwest whilst dumping impressive amounts of snow in the lowlands. And now…is 2009 next? Mother Nature bit us in 2006 and has continued to give us periods of extreme temperature anomalies since that time and it appears…”she knows us better” and could bite again. If long range (heck, even short range!) models are correct, we could, at least momentarily, enter an “ice box” of sorts starting next weekend. Is everything set in stone? Heck no! But models have been toying around with this idea for a few days and has increased the strength and timing in certain models. 1. We have this big barrier that separates us between the Intermountain West: the Cascade and Rocky mountains (Click here to read KOMO Weather Producer Scott Sistek’s explanation on this). Often times models don’t take them into consdieration and give us more cold air than what is realistically possible. However, seeing such cold air show up as soon as next weekend gives me the impression that regardless of the mountains we’re going to get cold. 2. Models tend to sway between East and West with cold air. Sometimes too far east…sometimes too far west…we need it “in the sweet spot” so it hits us directly. 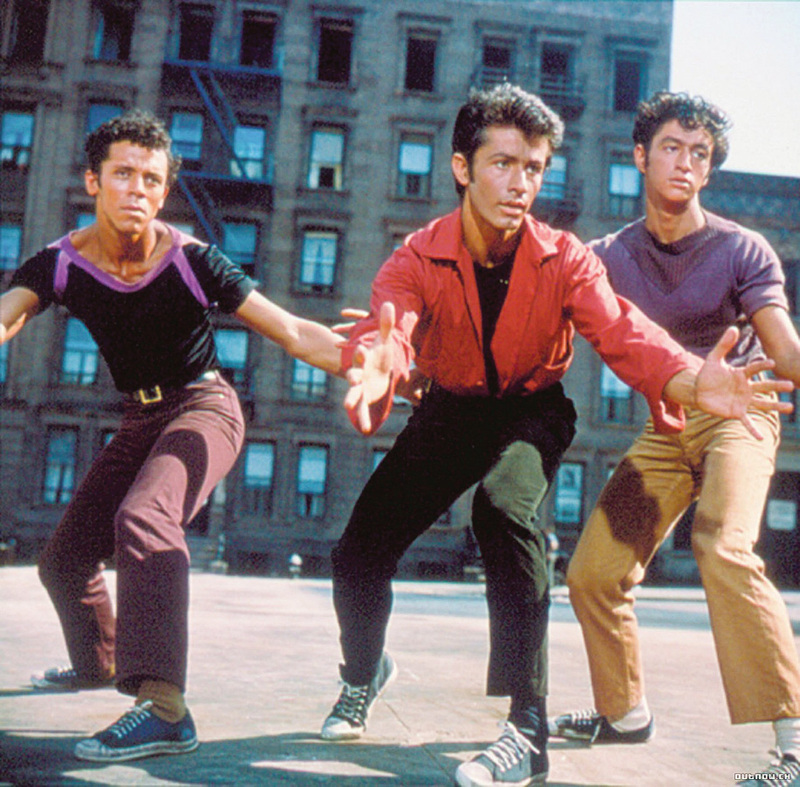 At this point, we want a little more westward movement. That’s what made December 2008 the classic “West Side (Weather) Story”! 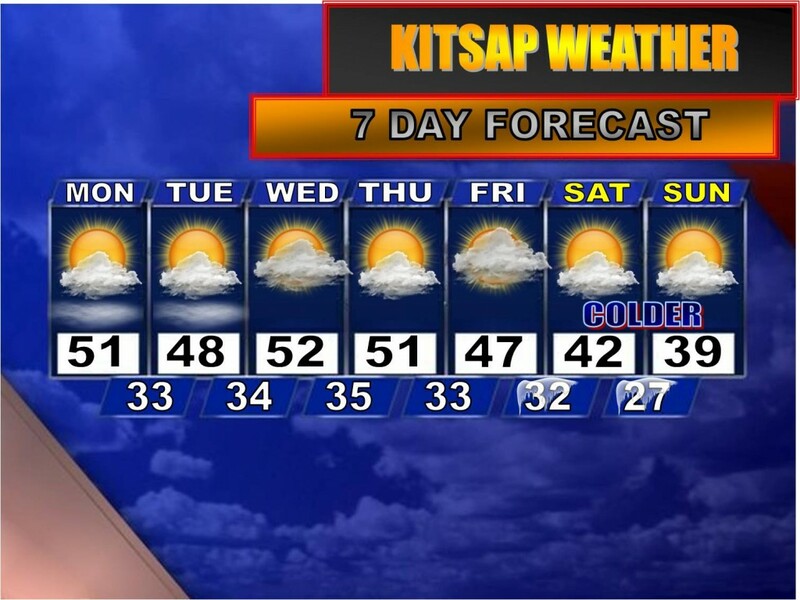 As for this week, expect chilly nights in the 30s but partly to mostly cloudy days with highs in the mid 40s to low 50s. Pretty seasonable, if not slightly warmer than seasonable, for this time of year. Next weekend, however, could be a much different story. 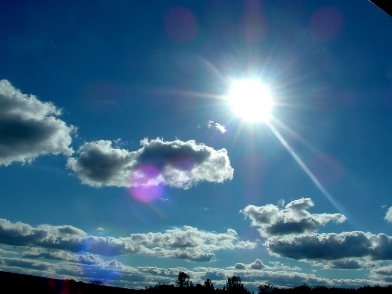 Long Range Forecast: Turning Much Drier and…??? I hope you all have had a wonderful Thanksgiving holiday! Luckily, most of Thanksgiving’s rain occurred early in the morning, leaving the daylight hours mainly cloudy with a few sprinkles. It’s time to venture out into the long range world once again, but this time I’m not going to be forecasting extremely wet weather! In fact, just the opposite. Long range forecast models have been very consistent in building a huge ridge of high pressure over our area keeping us dry for at least a week and a half, if not more. Now I have a bit of good news and bad news depending on what kind of weather enthusiast you are. Weather models have been going back and forth between how dramatic the temperatures will be by next weekend and beyond as the ridge continues to strengthen. I’m not exactly seeing any warm anomalies in the models, mainly cold. I’m not even going to mention how cold, but we could be flirting with some cold days and nights in the not too distant future if models are right. Of course, the next question is: “If we’re going to be cold enough for snow…will it snow?” Before we even talk about snow, we need moisture, and it appears we’ll be lacking if any cold air does arrive because it looks like a “dry cold”, similar to the November 2006/January 2007 arctic intrusion. Yeah we had some snow, but not a whole lot, and it was mostly powdery and dry. Because of the high uncertainty regarding model guidance, I am too chicken to make any long range predictions at this point. I’ll continue to monitor each run to see if I can find further consistency. Until then, enjoy the dry weather! 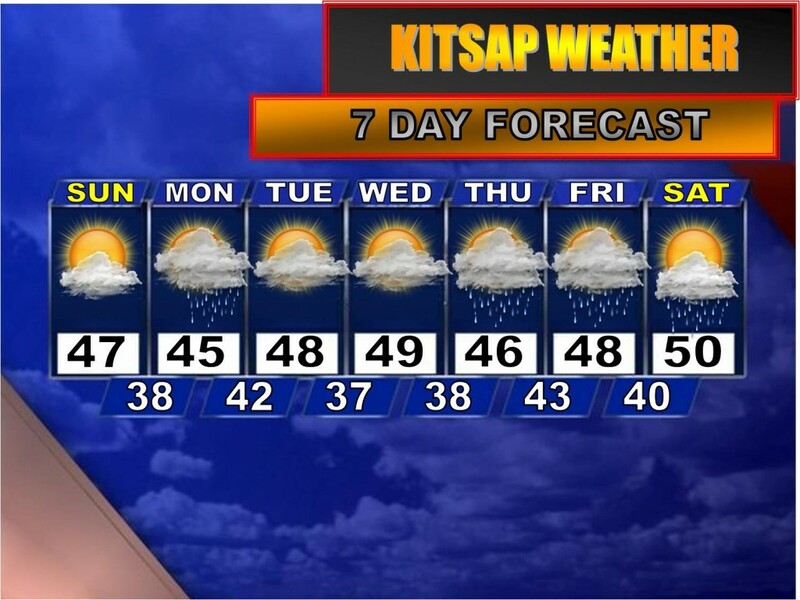 Today will be wet at times, but next week will be wonderful for the first week of December! 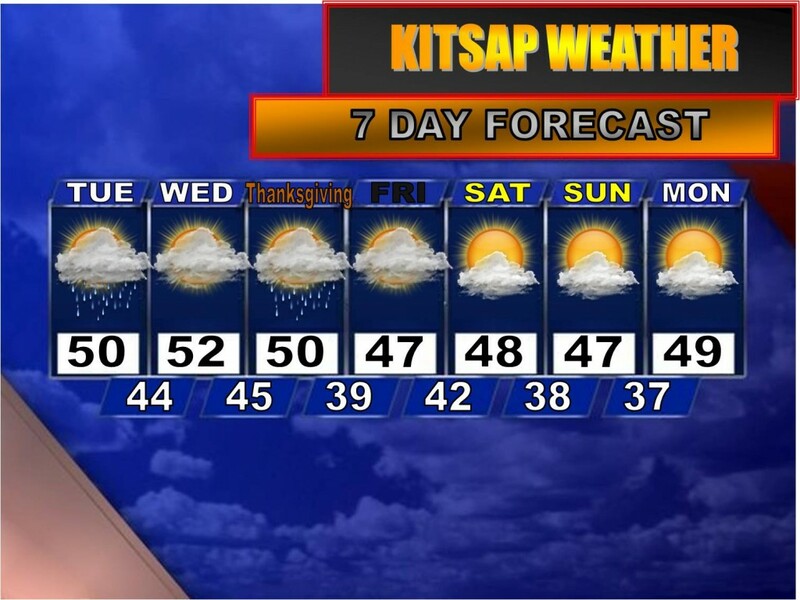 Thanksgiving Weather Forecast: A lot to be Thankful For! I love September-December. Such an exciting period of time. The leaves change, the weather starts to get interesting again, the fun holidays occur all within the span of 3 months, the family comes together…there are many things to be thankful for! 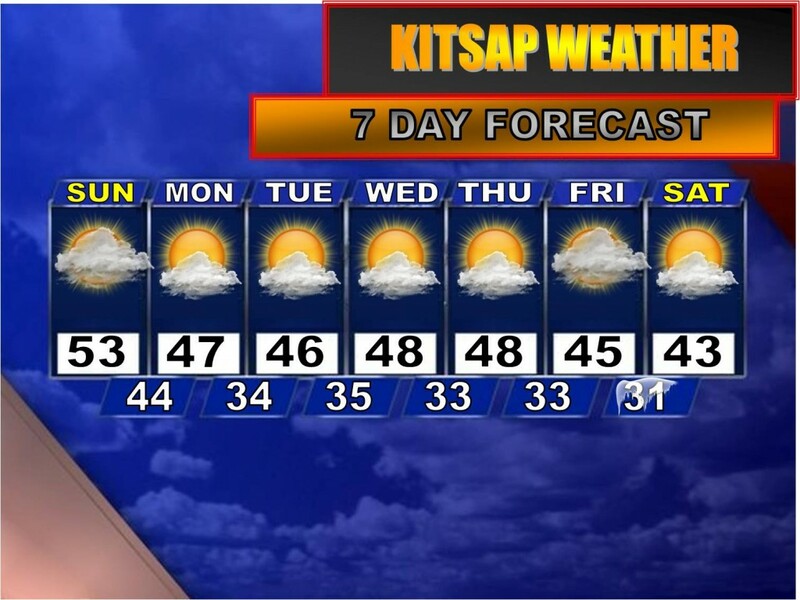 Another thing to add to that gratitude list is calmer weather in the forecast for the next 7-10 days. Sure, there will be rain for your Thanksgiving Day, a little over the weekend and the beginning of next week, but it appears a ridge will strengthen through most of next week, allowing sunnier, but cooler weather to enter our region for the first week of December. Won’t that be nice for a change? Of course, long range models turn the hose back on during the 2nd week of the new month but hey…enjoy the pleasant weather while it’s here! 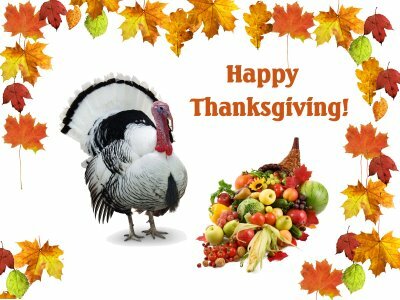 I hope you all have a great and safe Thanksgiving! 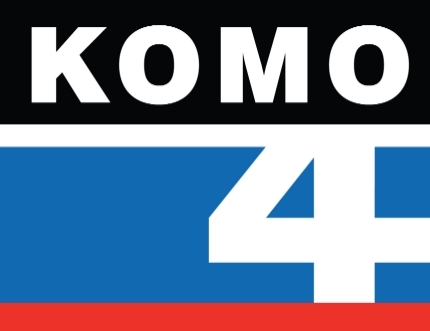 My good friend and mentor, Scott Sistek, published a blog post about my long range winter forecast that appeared on the main page of KOMONews.com this afternoon and it is one of the top stories as of this evening! He is a big reason why I decided to pursue TV weather broadcasting as a career. I started writing him when I was 11 and have kept in good contact through the years. Anyway, I found this exciting to see! Click here for his blog post. I think by now many of you are ready to catch your breath: windstorms, rainstorms, thunderstorms, funnel clouds, hail, flooding, heavy mountain snow and even some lowland flakes…all in less than a month! But this week? Indeed, our dear Mother Nature has seen our white flags of surrender and is giving us a break this week. Does this mean absolutely no rain, clouds or wind? Not exactly…but it does mean nothing significant is expected to roll through the region, meaning Thanksgiving travel should be relatively stress free. Other than a few showers tomorrow, Thanksgiving Day and Black Friday, nothing too notable looks likely for the next 7 days. Looking ahead at the long range weather models, we may even begin a little dry streak this weekend into the first few days of December. Now wouldn’t THAT be nice! Have a great evening everyone and safe travels! Heh heh…no kidding! A juicy storm system that has moved into the area is packing quite the punch. Not only is it raining pretty moderately out there, but temperatures are quite chilly in the mid to upper 30s. There are even some reports of slushy wet rain/snow in the Seabeck/Hood Canal area with some light accumulation on the dirt/grass. And you know what? It wouldn’t surprise me to hear of more reports of a wintry mix of rain and wet snow through the night as this cold storm blows through. Winds will also pick up. Totally out of the blue, but hey…this is the Northwest and the weather can do whatever it wants! 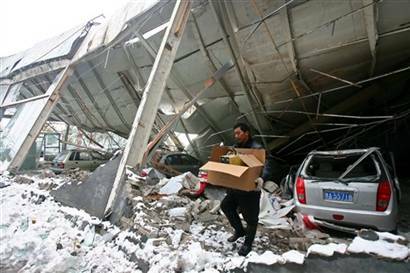 Severe Snowstorm in China Kills 40: Cloud Seeding Involved? BEIJING – Unusually early snow storms in north-central China have claimed 40 lives, caused thousands of buildings to collapse and destroyed almost 500,000 acres of winter crops, the Civil Affairs Ministry said Friday. Nineteen of the deaths resulted from traffic accidents related to the storms that began Nov. 9, the ministry said in a statement on its Web site. The snowfall is the heaviest in the northern and central provinces of Hebei, Shanxi, Shaanxi, Shandong and Henan since record keeping began after the establishment of the Communist state in 1949, the ministry said without giving detailed figures. 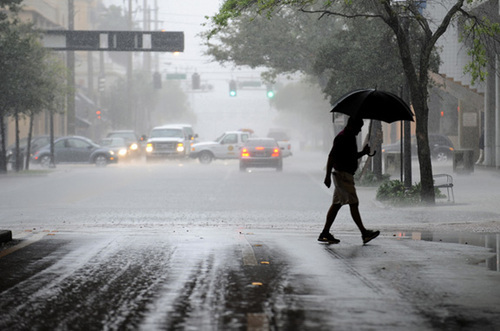 It estimated economic losses from the storm at $659 million. 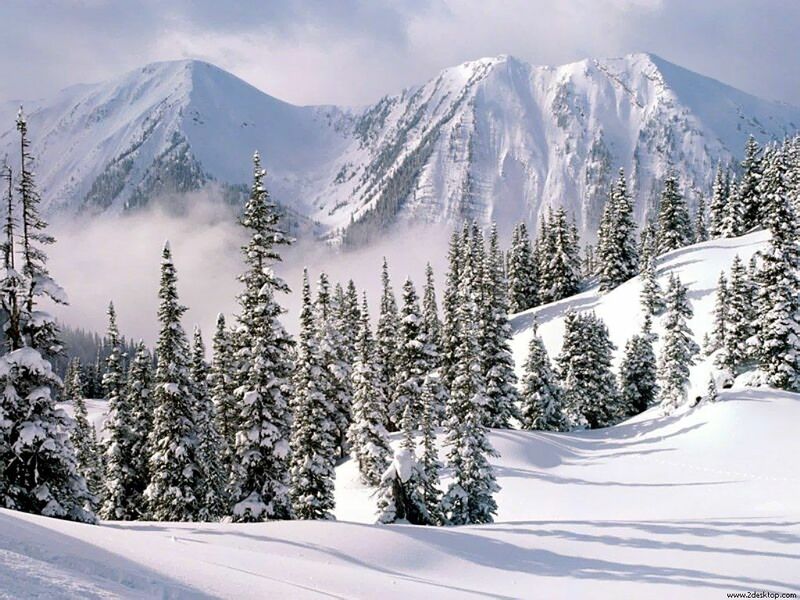 Chinese state media say some of the snow was induced through cloud seeding, although the precise amount of snowfall in all areas was not reported and it wasn’t clear what the previous records were. 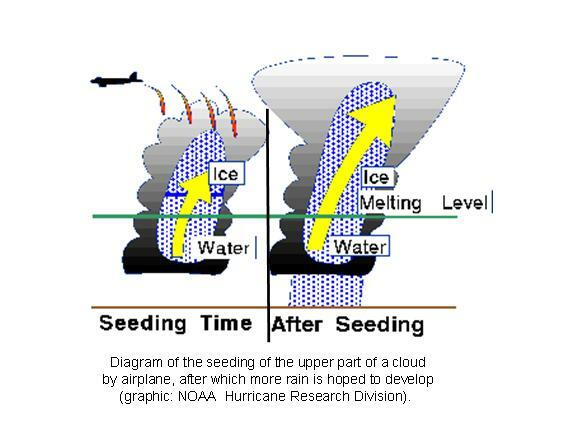 So the obvious question is: what in the heck is cloud seeding? In simple terms, it’s the spraying of silver iodide aerosols or dry ice “in the upper levels of the clouds to stimulate the precipitation process”. Of course, seeding is man-made. Someone has to physically fly a plane over a mass of clouds and spray chemicals into them. It’s not as easy as it sounds, but it can be done. So why exactly was cloud seeding occurring in China? A little while back I talked about Russia’s Mayor authorizing a spreading of chemicals into the atmosphere to limit the snow in Moscow, but it’s interesting we’re hearing about the reverse happening. 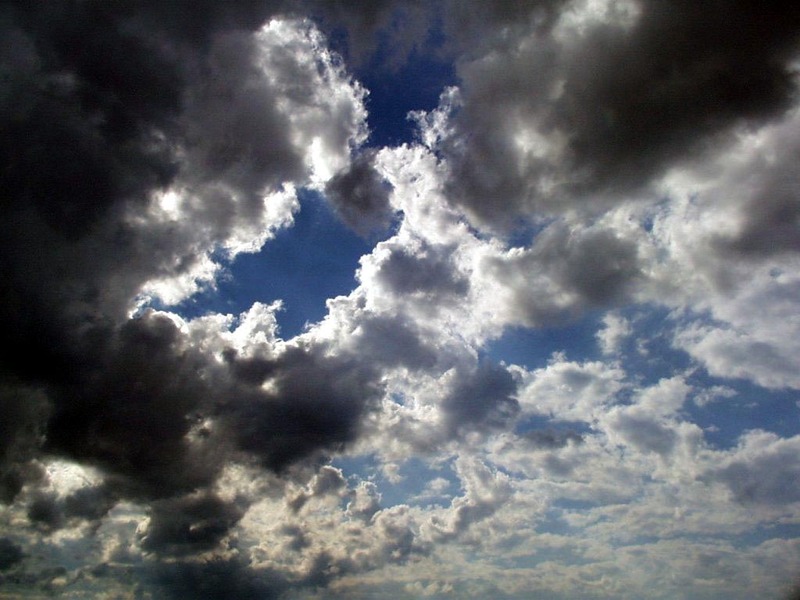 Is it smart for man to intentionally manipulate the weather? Maybe those participating in the seeding process think they have control over the weather, but what plays out afterward is all a coincidence? Maybe seeding has no effect at all. 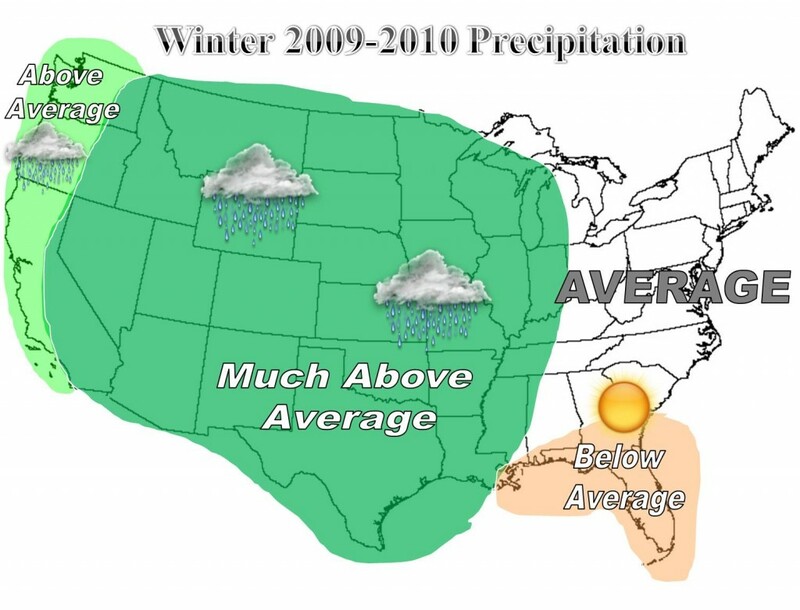 Winter 2009-2010: Get Ready for a Winter of Extremes! Alright…what’s it gonna be? Snowy? Cold? Warm? Wet? Dry? We’ll find out after this long commercial break! Just kidding 😉 After months of research and preparation I have finally completed my winter outlook for the nation with specifics for Western Washington and Oregon. I realize I have readers from all across the country, so if you would like any specifics for your area that are not covered in this blog post, feel free to drop me a comment or e-mail and I’d be happy to provide some insight. A little disclaimer here: this forecast should not be taken as gospel. It is quite common for people to take forecasts like this and expect them to verify word for word. Long range forecasting is an imperfect science, but I believe there are enough signals out there that can point to a long range pattern or trend developing. Such is the case this winter. We’ve (the Northwestern region of the U.S.) had a ridiculously wet fall after an anomalously dry late spring/summer/early fall. However, storms have been in abundance since May with several thunderstorms/funnel clouds reported all over the Northwest. This is highly unusual. Western Washington averages about 2 funnel clouds/tornadoes a year…we had 2 in just 2 months. Another noticeable quality about the weather lately is the extreme nature of the weather trends. I expect this same pattern to continue through Winter 2009-2010. The nation as a whole will see more snow and ice storms than usual, particularly in the country’s mid-section. The East and West Coasts, however, will average about normal storm-wise, though this can be a bit misleading when just looking at the maps and I’ll explain in just a moment. The southern portions of the U.S. will experience more tranquil weather than the rest of the country, especially in the southeast. Normally an El Nino winter would equate to cooler and wetter than normal conditions in the southeast. Not this year. According to my research, expect drier and milder conditions with mild, but wet conditions in the south/southwest. Overall, severe storms will be lacking all across the south. From coast to coast, the cold and warm air will be distributed fairly evenly, however the east coast looks to be a bit more prone to ridging and mild weather, especially in January. Overall, expect a colder and wetter than normal winter for much of the nation excepting the far west and east coasts and southern tier states. My forecast for the Northwest from December-February is calling for extremes in temperatures and precipitation, with stretches of unusually cold and wet weather for the first half with unusually dry and mild weather the 2nd half. When all is said and done, both ends of the spectrum will be so extreme, it will even out to “average”, This winter will likely be warmer and drier than the last 2 winters, however. Mountain snow fall will be above normal, averaging anywhere from 120-150% of normal. Lowland snow fall looks to be above normal as well with a Seattle/Portland snowfall depth average of 8”. Despite the moderate El Nino, the Pacific SST’s (Sea Surface Temperatures) and PDO (Pacific Decadal Oscillation) are in a negative phase and look to balance between weakly negative to neutral through the season. That along with an unusually strong Pacific Jet could very well increase our chances of receiving greater amounts of snow and rain than in a typical El Nino year, at least during the first half of winter (Dec and Jan). My main analogs are 2006, 1968 and 1965, 2006 being weighted the heaviest. These analogs match closely with our most recent summer/fall pattern and I believe they will continue this winter. So there you have it! The pendulum will continue to swing this winter. We’ll check back in April to see how I did! Comments, questions and/or suggestions are always welcome so feel free! The Best Forecast Bust Ever! Clearly today was supposed to be MUCH cloudier and wetter than it has been. Luckily, the 2nd punch of our storm quickly barreled through last night, knocking out power to several, but scooted out of here by sunrise. If I’m going to get a forecast completely wrong, it might as well be in this situation when I predict gloom and doom only to have sunny skies instead! But I suppose we’re not completely out of the woods: the atmosphere is still plenty unstable, and showers that DO show up will produce bursts of wind, heavy rain and/or hail. Yesterday definitely was NOT a forecast bust as close to 2” of rain fell across the Peninsula with over 8” across the southern end of the Olympic Mountains along with gusty winds of 40+ mph. If you want some more, Thursday, later Saturday and Monday of next week will feature a lot of the same: heavy rain and breezy conditions. Ready for Round Two of the Storm Parade? This is “sitting by the fire” weather for sure! Expect periods of moderate to heavy rainfall to persist through the evening/night with wind at calm levels until later on tonight as a secondary storm front blows through the area. 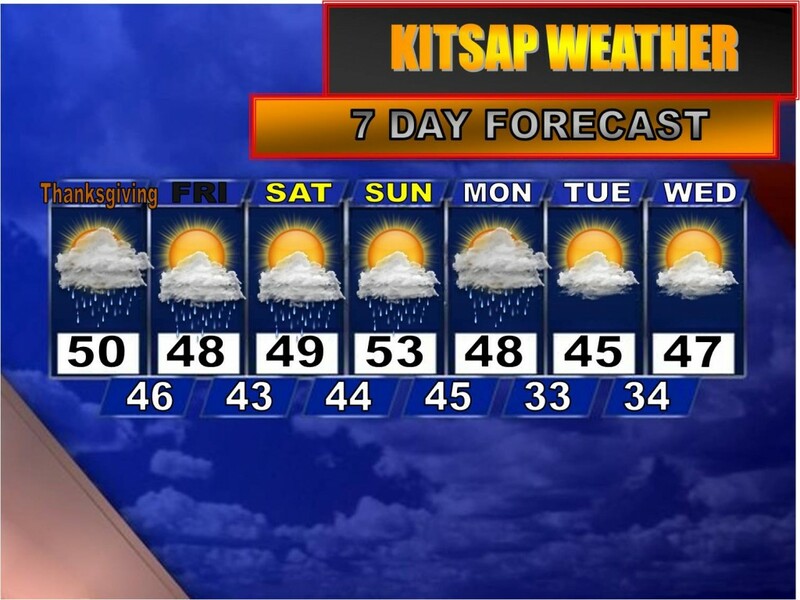 Winds will increase to sustained levels of 20-30 mph across the greater Kitsap Peninsula with gusts as high as 50. With gusts as high as expected, I wouldn’t be surprised to hear of some downed trees/power lines by tomorrow morning. Heavy rain will continue tomorrow but subside, along with the winds, by the afternoon. By then we can all release a BIG sigh of relief before more rain and wind overtakes the area Wednesday evening into Thursday. More rain (at times moderate) will continue throughout next weekend into the following week, but the good news is this will be cold rain, so that means making up for lost snow in the mountains!